Atiku Abubakar, the presidential candidate of the Peoples Democratic Party (PDP), has been advised to withdraw his case against President Muhammadu Buhari at the election petition tribunal. The Independent National Electoral Commission (INEC) had declared Buhari winner of the 2019 presidential election which took place on February 23, 2019. 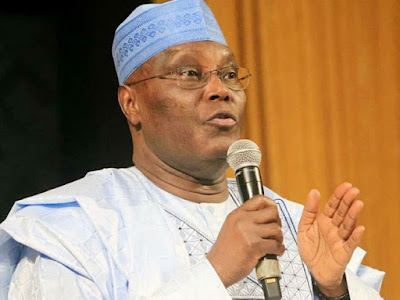 Atiku claims he won that election with well over 1.6 million votes. The former vice president has since assembled a team of 20 lawyers and 400 witnesses to challenge Buhari’s victory at the tribunal. But, some governors on the platform of the All Progressives Progressives (APC) say Atiku is only wasting his money. The governors of Edo and Niger states, Godwin Obaseki and Abubakar Bello, respectively, mocked the presidential candidate of the PDP for challenging Buhari’s victory at the poll. They spoke separately with State House correspondents after meeting with Buhari at the Presidential Villa, Abuja, on Thursday, March 21, 2019. Bello accused Atiku’s advisers of merely wanting to “make money” off the former vice president. But, Livy Uzoukwu, counsel to Atiku, says the legal team of the PDP and former vice president has all the facts to back its case against Buhari.